Will Komorowski and his party impose martial law if Poles say no to their peace and security vision? Will Komorowski and his party impose martial law if Poles say no to their “peace and security” vision? Some well-informed claim that Bronisław Komorowski will speak and act according to whatever is written for him, whereas he will forget whatever is communicated to him verbally. This might be the case with the latest “appeal” by the PO’s (Civic Platform) presidential candidate, in which Bronisław Komorowski was shaking his fists and threatening to marginalize all those who oppose his “peace and security” vision. Such statement is rather controversial when coming from a former anti-communist activist, but it is not the first one of this type. 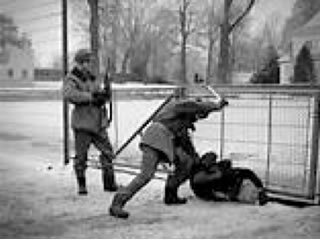 Mr. Komorowski suggested the possibility of using physical force to tackle the KPN (Confederation of Independent Poland) protesters back in 1989, when he had already been in power. Even the leading communist Czesław Kiszczak was advising him against it. Should it be assumed then, that the current electoral statements, so reminiscent of the communist empty slogans, such as “Zgoda buduje” (in Polish: peace is constructive), are suggested to Mr. Komorowski by someone? After all, his closest team of advisors is full of post-communists who would be expected to come up with “peace and security” and the threat of marginalization to those who oppose them.